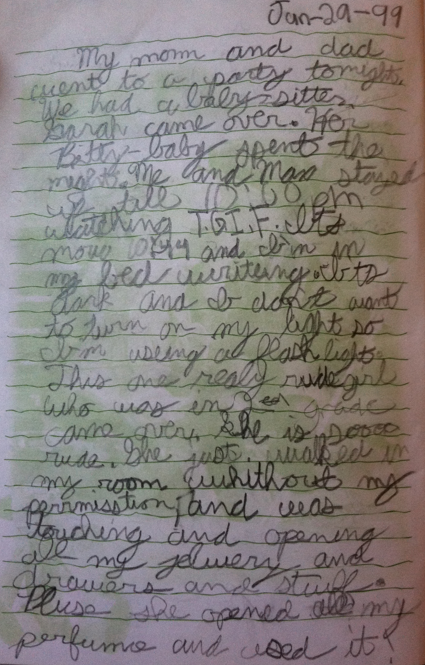 Here we go again…another excerpt from my diary, circa 1999. This stuff writes itself, seriously, because it was already written. All I had to do was find it and take a picture of it. Since Sarah wasn’t allowed to spend the night, obviously her Bitty Baby spent the night instead. This is a shout-out to all who had to settle for a Bitty Baby because American Girl dolls cost a crap-load. Holla at cho American gurl. Side-note: I permanently ruined my Bitty Baby months later while dressing her up as an “Indian” for Halloween. I drew dots and lines all over her face with a “washable” marker. Can’t wash away the lines of prejudice. Anyways back to the diary. Dang, stop getting off track. 10:44 pm?! And TGIF? What a little BA. But…I chose to spend this time journaling under my covers. Nerd. Also, let’s be real, the flashlight was just so that I felt cool. Like Harriet the Spy or an Olsen twin. The second half of this entry can be summed up as “A Cry for Justice”. Pluse, you should be lucky I gave you my permisstion to read my journal. 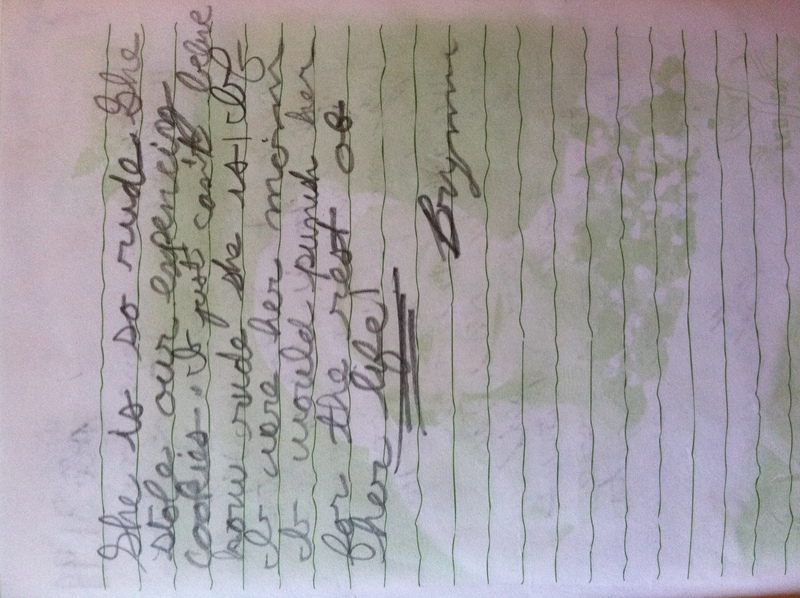 The perfume and cookies must have been pretty darn “expensiz”…seeing that I thought a LIFE SENTENCE was justified. Sorry for yelling. Notice I didn’t say “ground for the rest of her life”, but “punish”. Sadist. Lastly, “rude” is still my favorite adjective. And if I’ve ever called you rude in person, you can bet there is a diary entry just like this in my current journal. Serious (Black). Who is/was the rudest person you’ve ever met? And/or what are your favorite cookies? haha “can’t wash away the lines of prejudice,” great one! Awesome spelling errors too, hilarious. Yet another great blog. The rudest people are the ones that don’t look both ways crossing the street and just GO. They assume we will stop, yes it’s true but that doesn’t mean we want to. Being a bus driver for 2 years made me aware of this and cannot stand it. man, that second grader sounds like the absolute worst! just the worst…a genuinely horrible person. And all the time we thought you really wanted Bitty Baby instead of the more grown up American Girl dolls – you actually asked for Bitty Baby – a true self-sacrificing gesture, ha ha! I hope I made up for you settling for second best when I knitted a full wardrobe for BB! What about Chip & Dale Rescue Rangers? And speaking of chips, favorite cookies would be chocolate chip, naturally. The 1990s were the best decade to home on a Friday night. My jam was Boy Meets World and Two of a Kind, naturally.